A study conducted by scientists from University of California - Irivne has revealed that most of Antarctica's ice loss is due to warm ocean water melting the base of Antarctic ice shelves rather than from calving icebergs breaking off into the sea. A comprehensive survey of Antarctica's ice shelves – the first of its kind – showed that 55% of ice shelf loss recorded between 2003-2008 was attributable to basal melt from warm waters dissolving ice on the underside of ice shelves. These findings are much higher than previously thought, and considering that ice shelves fringe 75% of Antarctica, could prove to be a game changer in terms of future projections of ice thaw on the continent. The results of the study, which were published online in Science (13 June 2013), will assist scientists to more accurately project how Antarctica – which holds approximately 60% of the Earth's freshwater reserves stored within its extensive ice sheet – will respond to ocean warming, as well as its future contribution to sea level rise. Ice shelves form as a result of glaciers flowing into the sea and from snow falling and accumulating on the ice surface. 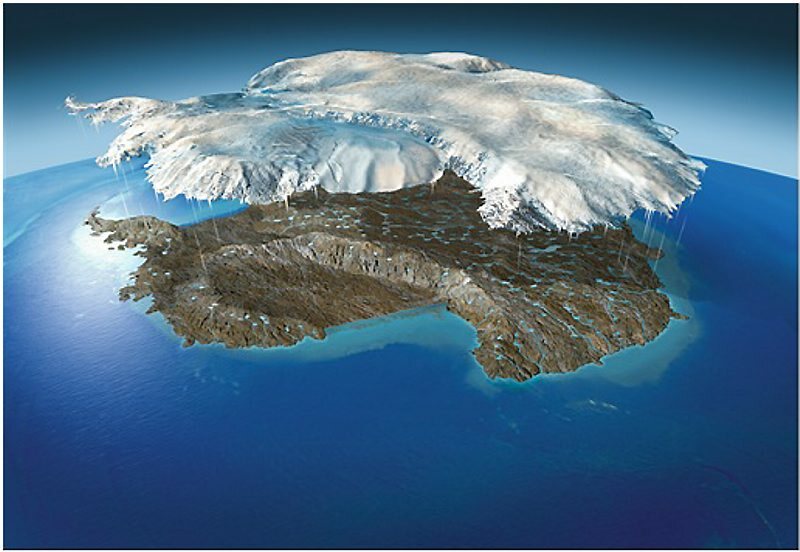 Using a regional snow accumulation model together with a new map showing Antarctica's bedrock with ice shelf thickness, elevation and velocity data captured by Operation IceBridge – an ongoing NASA aerial survey of Greenland and the South Pole – the scientists discovered that ocean melting is not evenly distributed around the continent's ice shelves. Three of Antarctica's largest ice shelves: Ross, Filchner, and Ronne, which together account for two-thirds of Antarctica's ice shelves, accounted for only 15% loss, while fewer than a dozen smaller ice shelves that floated on relatively warm water produced 50% of the total meltwater over the same period. The research team also made comparisons between the rate of ice shedding on ice shelves and the rate of mass loss on continental ice sheets. They concluded that, overall, mass loss on the ice shelves occurred twice as fast as mass loss on the continent's ice sheet. There are two enormous risks from Antarctica under global warming. 1. Ice sheet triggered to an unstable state of unavoidable irreversible collapse. ​​We are past that for the West Antarctic ice sheet. methane CO2 & nitrous oxide​. ​The big global warming concern about Antarctica is the extreme sea level rise that would follow the loss of the huge ice sheet by melting and destabilization. ​ This threat to the world's coastal regions comes from the West Antarctic ice sheet (WAIS), which rests on a bed far below sea level and so has the potential for collapsing into the sea. ​​The Antarctic ice sheet contains sufficient ice to raise world-wide sea level by more than 60 meters if melted completely. 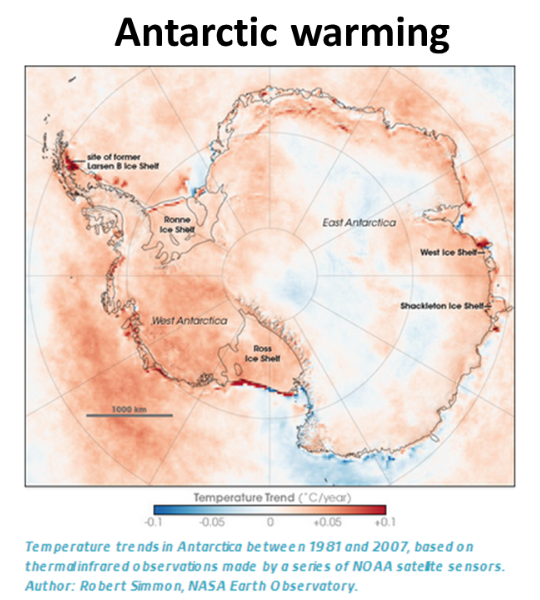 ​​The West Antarctic Peninsula is one of the fastest warming areas on Earth, with only some areas of the Arctic Circle experiencing faster rising temperatures. 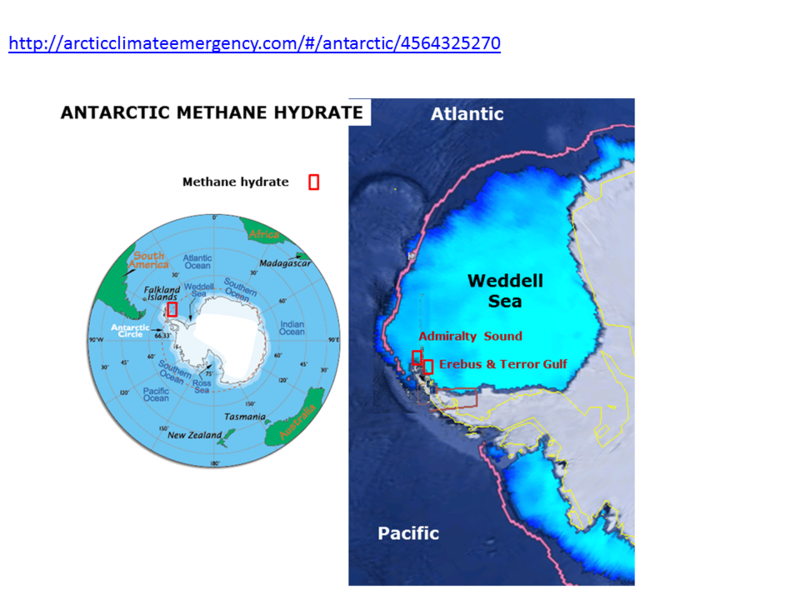 There is another danger from the warming Antarctic, potentially worse than sea level rise like the Arctic, Antarctica holds frozen solid pressurized methane gas hydrate, which is vulnerable to warming. ​​A 2012 study estimated that 50 percent of the West Antarctic Ice Sheet (1 million square kilometers) and 25 percent of the East Antarctic Ice Sheet (2.5 million square kilometers) overlies pre-glacial sedimentary basins containing about 21,000 billion metric tons of organic carbon. ​This is an immense amount of organic carbon, more than ten times the size of carbon stocks in northern permafrost regions. Methane could be released during episodes of ice-sheet collapse acting as a positive feedback on global warming. ​​Research by Renbin Zhu published 2007 showed warming Antarctic tundra wetlands to be emitting methane (.